Week of Jan 22 – Jan 28: Click GoogleForm to submit answers. Please see answers below. Version : This week we will count the number of integer solutions to a particular type of equation. It uses a technique called “stars and sticks”. The problems this week are quite simple, and I hope they can be solved without knowing the technique explicitly. Next week I’ll present the technique in detail and post harder problems. Jan 22: How many solutions to are there if and are nonnegative integers? Jan 23: How many solutions to are there if and are nonnegative integers? Jan 24: How many solutions to are there if and are nonnegative integers? Jan 25: How many solutions to are there if and are nonnegative integers? Jan 26: How many solutions to are there if and are nonnegative integers? Jan 27: Do you recognize the numbers you in found in the previous 5 problems? In general, how many solutions to are there in terms of , if and are nonnegative integers? Jan 28: How many solutions to are there if and are positive integers? [Answer:] This is the same as finding the number of nonnegative integers for . Version : We work on circle problems this week. Jan 23: Circle has a radius of . Circle has a circumference of . Circle has an area of . List the circles in order from smallest to largest radius. Jan 24: Six pepperoni circles will exactly fit across the diameter of a -inch pizza when placed. If a total of circles of pepperoni are placed on this pizza without overlap, what fraction of the pizza is covered by pepperoni? Jan 25: A square and a circle have the same area. What is the ratio of the side length of the square to the radius of the circle? Jan 26: Three circular arcs of radius 5 units bound the region shown. 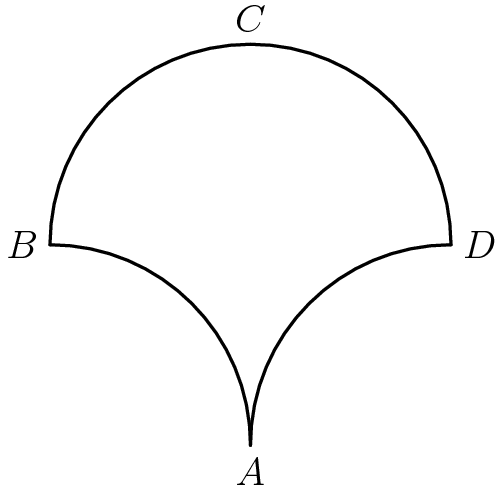 Arcs and are quarter-circles, and arc is a semicircle. 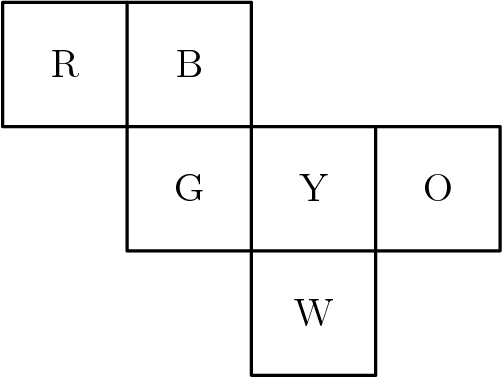 What is the area, in square units, of the region? Jan 28: Two squares intersect at right angles, bisecting their intersecting sides, as shown. 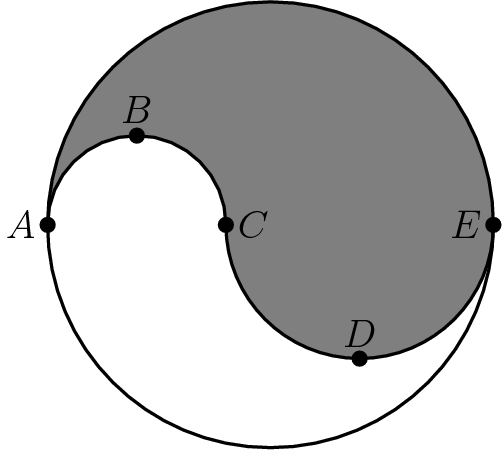 The circle’s diameter is the segment between the two points of intersection. 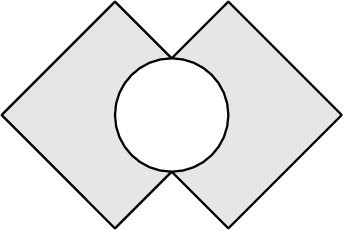 What is the area of the shaded region created by removing the circle from the squares? Week of Jan 15 – Jan 21: Click GoogleForm to submit answers. Version : Thank you to all who gave me feedback. Just like I’ve found with my own personal experience, counting and probability are the hardest types of problems. We will continue practicing counting problems this week. Jan 15: How many ways are there to put 5 balls into 2 boxes if the balls are distinguishable and boxes are distinguishable? [Answer:] 1) One box is nonempty: 1. 2) Two boxes are non-empty. The occupancy can be 1-5, 2-3. . So the total number of ways is 1+15=16. [Answer:] 6. The box occupancy can be 0-5, 1-4, 2-3, 3-2, 4-1 and 5-0. Jan 18: How many ways are there to put 5 balls into 2 boxes if neither the balls nor the boxes are distinguishable? Jan 19: How many ways are there to put 5 balls into , where , boxes if the balls are distinguishable and boxes are distinguishable? Jan 20: How many ways are there to put 5 balls into , where , boxes if the balls are distinguishable but boxes are not? Jan 21: How many ways are there to put 5 balls into , where , boxes if the balls are not distinguishable but boxes are? [Answer:] . This is a counting technique called “stars and stick”. We are working on it during the week of Jan 22-Jan 28. Extra credit: How many ways are there to put 5 balls into , where , boxes if neither the balls nor the boxes are distinguishable? [Answer:] At most 5 boxes are nonempty. The occupancy can be 1-1-1-1-1, 1-1-1-2, 1-1-3, 1-2-2, 1-4, 2-3 and 5. So 7 ways in total. Version : This week’s problems deal with distance and speed. Jan 15: On a dark and stormy night Snoopy suddenly saw a flash of lightning. Ten seconds later he heard the sound of thunder. The speed of sound is 1088 feet per second and one mile is 5280 feet. Estimate, to the nearest half-mile, how far Snoopy was from the flash of lightning. Jan 16: Homer began peeling a pile of 44 potatoes at the rate of 3 potatoes per minute. Four minutes later Christen joined him and peeled at the rate of 5 potatoes per minute. When they finished, how many potatoes had Christen peeled? Jan 17: Joe had walked half way from home to school when he realized he was late. He ran the rest of the way to school. He ran 3 times as fast as he walked. Joe took 6 minutes to walk half way to school. How many minutes did it take Joe to get from home to school? Jan 18: Cassie leaves Escanaba at 8:30 AM heading for Marquette on her bike. She bikes at a uniform rate of 12 miles per hour. Brian leaves Marquette at 9:00 AM heading for Escanaba on his bike. He bikes at a uniform rate of 16 miles per hour. They both bike on the same 62-mile route between Escanaba and Marquette. At what time in the morning do they meet? Jan 19: The students in Mrs. Reed’s English class are reading the same 760-page novel. Three friends, Alice, Bob and Chandra, are in the class. Alice reads a page in 20 seconds, Bob reads a page in 45 seconds and Chandra reads a page in 30 seconds. Jan 20: The students in Mrs. Reed’s English class are reading the same 760-page novel. Three friends, Alice, Bob and Chandra, are in the class. Alice reads a page in 20 seconds, Bob reads a page in 45 seconds and Chandra reads a page in 30 seconds. Jan 21: The students in Mrs. Reed’s English class are reading the same 760-page novel. Three friends, Alice, Bob and Chandra, are in the class. Alice reads a page in 20 seconds, Bob reads a page in 45 seconds and Chandra reads a page in 30 seconds. Version : We did committee-type of counting for 2 weeks. For the “mountain number” counting problem for Jan 7, most of you didn’t get it right. The right answer is 240, but I would like you to write out a complete solution and submit. For this week, we work on a new counting topic: paths on a grid. For example, you are at the origin (0,0) and would like to move to coordinate (2,3) along the grid line. Each move can either be vertically upward or horizontally to the right in one unit length. How many paths are there? We can go (0,0), (1,0), (2,0), (2,1), (2,2), (2,3), which corresponds to a sequence of moves RRUUU. (R for right; U for up). An alternative sequence of moves can be RUURU. Overall, 2 out of the 5 moves are U and 3 are R. So the number of paths is . Answers: ; ; ; ; ; 126-40 = 86; See Jason and Stephen’s solutions for Jan 14. Jan 8: How many paths are there from (0,0) to (5,2) if every move of unit length must be either up or right? Jan 9: How many 8-move paths are there from (5,0) to (0,3) if every move of unit length must be either up or left? Jan 10: How many 7-move paths are there from (4,3) to (0,0) if every move of unit length must be either down or left? Jan 11: How many 9-step paths are there from (0,0) to (5,4) if every move of unit length must be either up or right? Jan 12: How many 9-step paths are there from (0,0) to (5,4) if every move of unit length must be either up or right and every path must go through (2,3)? Jan 13: How many 9-step paths are there from (0,0) to (5,4) if every move of unit length must be either up or right and none of paths can go through (2,3)? Jan 14:[Please submit a complete solution.] We call a number a mountain number if the middle digit is larger than any other digit. For example, 352 is a mountain number, but 554 is not. How many 3-digit mountain numbers are there? [Jason’s solution] Since the middle digit must be bigger than the other digits, 1 cannot work for the middle digit. If the middle digit is 2, then there are two possibilities: 121 and 120. If the middle digit is 3, then the total number of possibilities is: 2*3 = 6 since 1 and 2 are possibilities for the hundreds digit and 0, 1 and 2 are possibilities for the units digit. If the middle digit is 4, then the number of possibilities is 3 * 4 = 12 and so on. Therefore, 1*2 + 2*3+3*4+4*5+5*6…+8*9=240$.
. So the total is . Version : This week’s problems are calculation puzzles. Jan 8: The operation is defined for all nonzero numbers by . Determine . Jan 10: In this addition problem, each letter stands for a different digit. Jan 11: For any positive integer , define to be the sum of the positive factors of . For example, . Find . Version , Week of Jan 1 – Jan 7: We will spend another week focusing on committee-type of counting problems. Jan 1: A committee has 5 women and 6 men. In how many ways can we choose a subcommittee with 3 women and 3 men? Jan 2: A school volleyball team has 13 players, including a set of triplets, Annie, Bonnie and Connie. In how many ways can we choose 6 starters so that no triplet is in the starting lineup? Jan 3: A school volleyball team has 13 players, including a set of triplets, Annie, Bonnie and Connie. In how many ways can we choose 6 starters so that exactly 1 triplet is in the starting lineup? Jan 4: A school volleyball team has 13 players, including a set of triplets, Annie, Bonnie and Connie. In how many ways can we choose 6 starters so that at most 1 triplet is in the starting lineup? Jan 5: In how many ways can 10 dogs be divided into a group of 4 dogs and a group of 6 dogs so that two puppies Buddy and Freddy are in the same group? Jan 6: We call a number descending if every digit is smaller than the digit that comes before it. For example, 532 is a descending number, but 554 is not. How many 3-digit descending numbers are there? Jan 7: We call a number a mountain number if the middle digit is larger than any other digit. For example, 352 is a mountain number, but 554 is not. How many 3-digit mountain numbers are there? Version , Week of Jan 1 – Jan 7: This week’s focus is on visualizing cubes. Jan 3: Six cubes, each an inch on an edge, are fastened together, as shown. Find the total surface area in square inches. Include the top, bottom and sides. Jan 4: Fourteen white cubes are put together to form the figure on the right. The complete surface of the figure, including the bottom, is painted red. 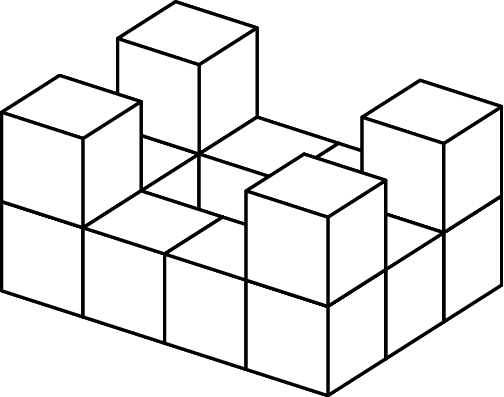 The figure is then separated into individual cubes. How many of the individual cubes have exactly four red faces? 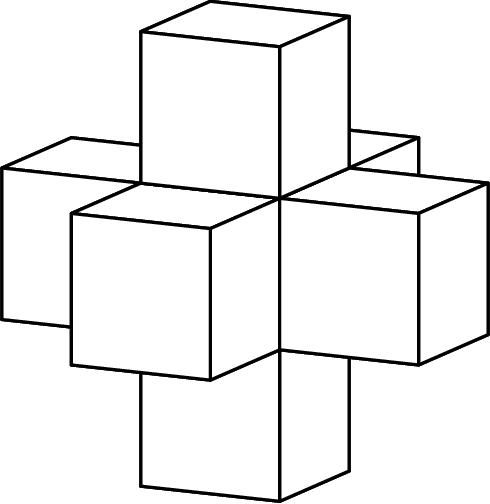 Jan 5: A shape is created by joining seven unit cubes, as shown. 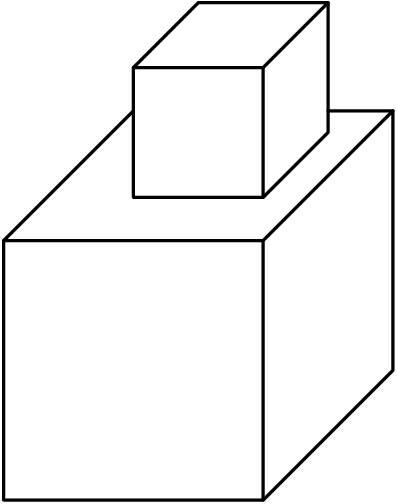 What is the ratio of the volume in cubic units to the surface area in square units? 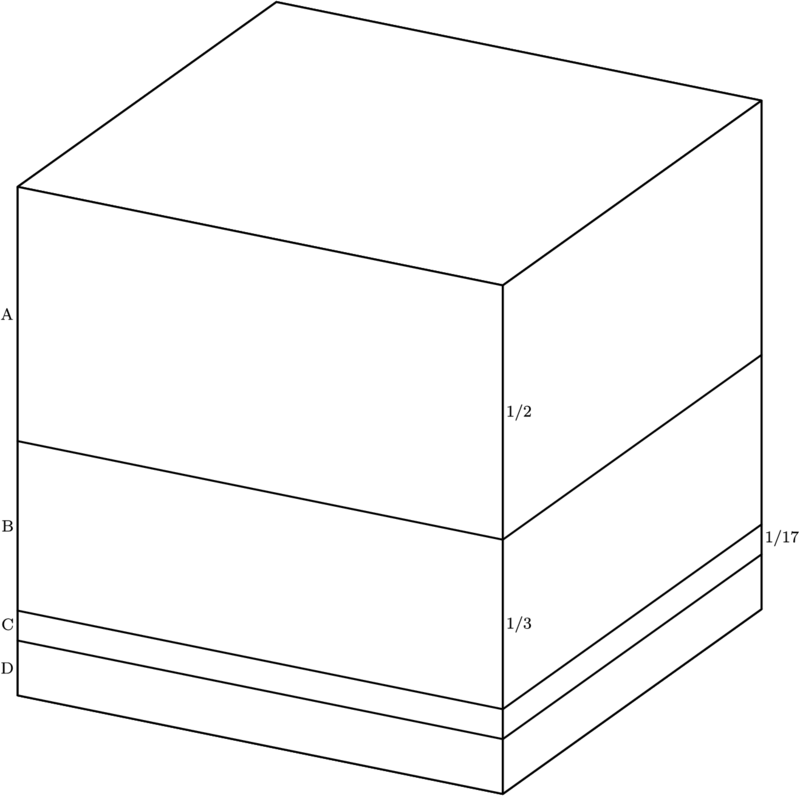 Jan 7: A one-cubic-foot cube is cut into four pieces by three cuts parallel to the top face of the cube. The first cut is foot from the top face. The second cut is foot below the first cut, and the third cut is foot below the second cut. 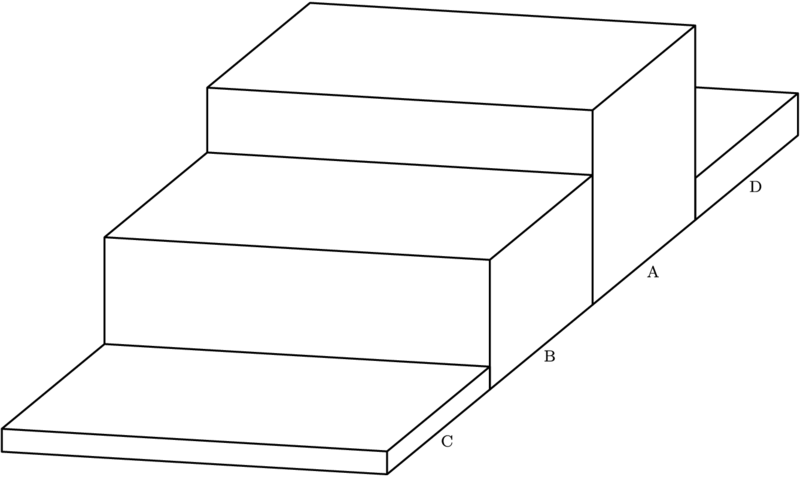 From the top to the bottom the pieces are labeled A, B, C, and D. The pieces are then glued together end to end as shown in the second diagram. 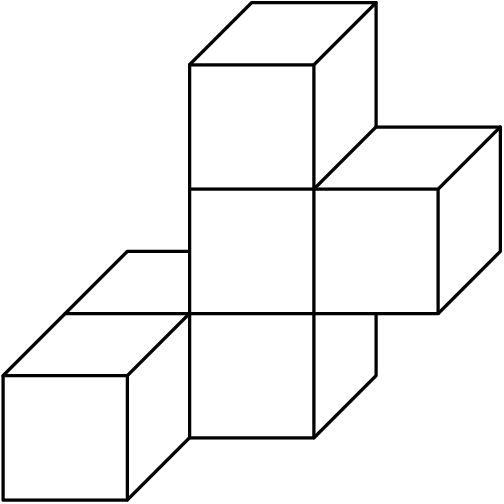 What is the total surface area of this solid in square feet?